One of the most glorious ways to spend a day in spring is to drive to the National Rhododendron Gardens in Olinda, just outside Melbourne. 15,000 rhododendrons bloom in brilliant colours across 100 acres of hillside. The vista is breathtaking, whichever direction you gaze. The paths meander up and down the hills and you are enveloped in a cathedral of colour as you stroll along – hot cyclamen, blushing pink, pearl white, deep purple, flame orange, buttery yellow – each bush laden with flowers of overwhelming beauty. The variety and gradations of colour, the sheer lusciousness, dazzle the eye. A large variety of other plants complement the rhododendrons – rows of cherry trees with their delicate pink blossoms, banks of colourful azaleas, camellias, magnolias and daffodils. Abundant vegetation, shady trees and beautiful green lawns. It’s an ideal place to walk, to picnic on the grass, and to rest by the two lakes. The Rhododendron Gardens are an hour’s drive from Melbourne. As you take the winding road up into the cool hills of the Dandenong Ranges, you are surrounded by soaring eucalyptus trees and dense ferns. These native Australian plants provide the backdrop for an extraordinarily successful plan to transplant and conserve threatened rhododendron species. Australia, with its hot climate, would seem the least suited place in the world to save rhododendrons, particularly since these flowers originated in the snowy Himalayas. The earliest records from 1701, chronicle an Englishman going into China’s inner mountain ranges to collect and send back to England 600 dried specimens of rhododendron. In his famed book, ‘ The Snow Leopard’, Peter Matthiessen notes the rhododendrons at 12,500 feet on his trek up the Himalayas. He marvels that the ” rhododendron leaves along the precipice are burnished silver” as they reflect the light of the glaciers. In 1960, the members of the Australian Rhododendron Society persuaded the then Premier of Victoria, Henry Bolte, to grant 100 acres of state land to establish gardens dedicated to rhododendrons. The members of this Society then volunteered to undertake the herculean task of clearing the land, much of it by hand, and planting rhododendrons. During the long hot summers, volunteers of the Women’s Auxiliary would drag heavy buckets of water up and over the hills to save the young plants. Since then, 384 of the 1157 species of rhododendron, or one-third of the genus, are threatened according to a study. Forest loss, climate change and population growth have all had a negative impact. The Rhododendron Gardens are now under the management of Parks Victoria, but the ARS is still actively involved. They organised a Convention in October to bring together international experts, Australian and overseas field workers, park managers and collectors to discuss the challenge of rhododendron conservation in a changing world. They also inaugurated a newly restored greenhouse, Vireya House, which is dedicated to saving the vulnerable vireya species of rhododendron. Entry to the Gardens is free and even when the flowers are not in bloom, it is nevertheless a beautiful place to visit. And if you have not brought a picnic, after visiting the Gardens you can enjoy the many cafes and restaurants in the pretty villages of Olinda and Sassafras. 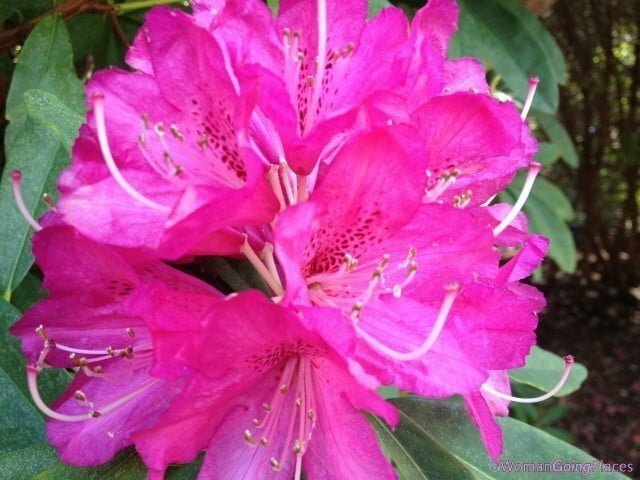 For all pictures of the spectacular rhododendrons go to our Gallery page.